Of all the countries that we have visited, Italy is probably our favourite (although Indonesia gives it a good run for its money). We return there time and again and are always amazed that there are so many lovely places to visit. Architecturally the country is something else, there are of course the famous places that we have all heard of and seen in a million pictures. But away from the tourist hotspots almost every town and village seems to be designed like something out of a story book with medieval towns and villages dotting the landscape. And what a landscape! 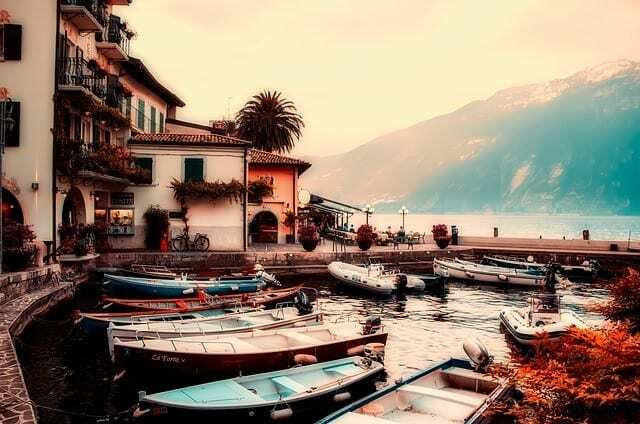 Italy has it all, from snow-capped peaks to white sandy beaches, it is no surprise that Italy is known as the ‘Bel Paese’ or ‘Beautiful Country’. 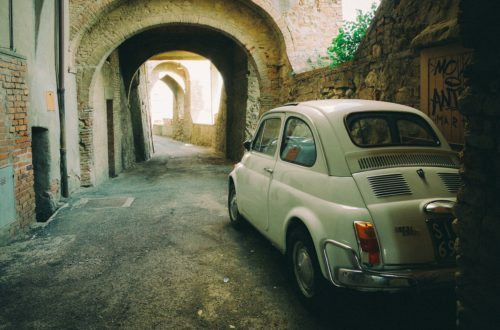 In this post we will pass on some top tips for travelling around Italy by public transport. We have also included the itinerary that we took across northern Italy from Bergamo to Venice. This was a two week trip with our 8 month old daughter travelling by train and bus which took in some of the cultural and natural highlights of the region. We went at quite a fast pace and this route could easily keep you busy for 3 or more weeks. Our route incorporated overnight stays in Bergamo, Torri-del-Benaco, Verona, Ortisei and Siusi in the Italian Dolomites, and Venice. We feel that this gives a perfect blend of nature and culture with the chance to get out hiking plus soaking up some of the nicest towns in the north. It is very easy to do by public transport and we show you how below. Travelling with a baby or toddler? 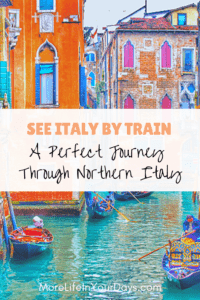 Italy has a great train network that reaches the majority of towns that you might want to visit. Tickets are reasonably prices and train services are efficient on modern trains. The price of you ticket varies depending on the class of the train and the speed of the service. In most cases you it is best to book tickets in advance as seat reservations are required, and it will ensure that you get the best price. You can do this online and get an electronic ticket sent to your phone or you can print them out. If, like us, you aren’t always good at planning ahead you can buy tickets at the station. It’s best to check online first so that you know which trains are best for you considering the overall journey time and cost. If you are booking online,Trenitalia is the official Italian Railways site. It can be slightly tricky to use as you will need to use the Italian place names (e.g. Venezia for Venice). ItaliaRail has a far more user friendly system that is all in English with the English-language place names used. Both sites have similar prices and even though Italiarail charges a small booking fee it can can sometimes work out to be cheaper, especially for more than one traveller. Overall ItaliaRail is the best system and is the easiest one to use it can also help you to find the best tickets as it displays trains and prices for the whole day rather than a narrow window. A great way to plan you route on public transport it to use the route planning feature on Google Maps. This is particularly useful if you destination is not on the train line. If you click on the public transport option for your journey it will show you the available options using a bus/train combination and show you the journey times and where you need to go. Local bus tickets should be purchased before you get on board and can usually be bought at a kiosk or shop near to the bus station, they must be validated once you are on the bus. The delightful town of Bergamo is often overlooked on itineraries for the north of Italy but is a great destination full of historic atmosphere and Italian charm. Perched high above the surrounding lowlands, the old part of town is known as the Citta Alta and is characterised by old cobblestone streets and shuttered properties, while an impressive Venetian wall encircles this old district. As with most Italian towns, our favourite thing to do is just walking around the town, popping into the interesting looking churches and finding a nice piazza to sit in. When we were there buskers created a magical atmosphere around the Piazza Vecchia and as ever there was a great gelateria on hand with some wonderful Italian ice cream (maybe this is the real reason we love Italy so much). You can ride the Funicular up to the Rocca di San Vigilio for fantastic views over the city, or down to the lower town which is newer than the upper town but still dates back several hundred years. Other must do’s in the town include walking the Venetian Walls which are listed by UNESCO as a world heritage site. This gives you a great introduction to the town with small parks and restaurants dotted along the walls, each with great views over the lower town and back to the Citta Alta with its ornate city gates. 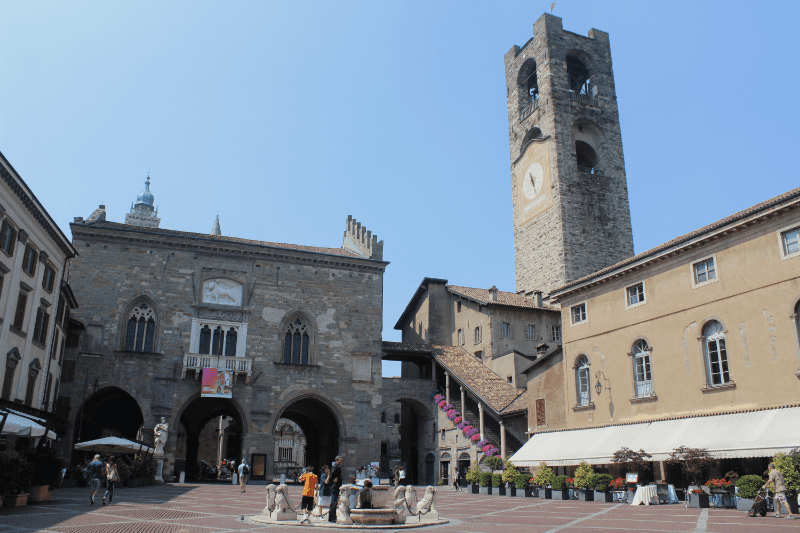 Check out our guide to visiting Bergamo here. Arrival: Fly to Milan Bergamo airport and catch bus No1 to Citta Alta. This departs every 30 mins. The bus also stops at the train station and other points in the lower town if this is where you choose to stay. Both the upper and lower towns are worth a visit but it is really the perfectly preserved medieval upper town that is the big draw for tourists and this area makes the ideal place to stay. Looking to book a room in Bergamo? Check out these great options! Bed & Breakfast A Casa Mia – Where we stayed. A lovely B&B just outside the walls of the upper town. There are fabulous views from the balcony and a delicious breakfast. Recommended. Bergamo Alta Apartment – Great for Families. Good value 2 bedroom apartments in the heart of the upper town. Relais San Lorenzo – Top rated on Booking.com. Enjoy a relaxing stay at this elegant hotel where you can indulge yourself at the spa with Finnish sauna, Turkish bath and sensory showers. Bergamo to Lake Garda: Take bus No1 back to train station and catch a train heading to Treviglio and then to Peschiera Del Garda Station, the journey takes just over an hour and a half. Walk the short distance to the bus stop and catch Bus 483 to Torri Del Benaco. Timetables for buses and ferries around Lake Garda can be found here. Torri del Benaco is the ancient capital of Lake Garda and is a lovely town well worth a visit, it is situated about half way up the east coast of Lake Garda where the rolling hills start to grow into towering mountains. It makes a great base to explore Italy’s largest lake, with ferries going to pretty much everywhere. The town offers lovely views across the lake which can be enjoyed from one of the many lakeside restaurants in the beautiful port area where hotels and boutique shops rest up against the old castle walls. 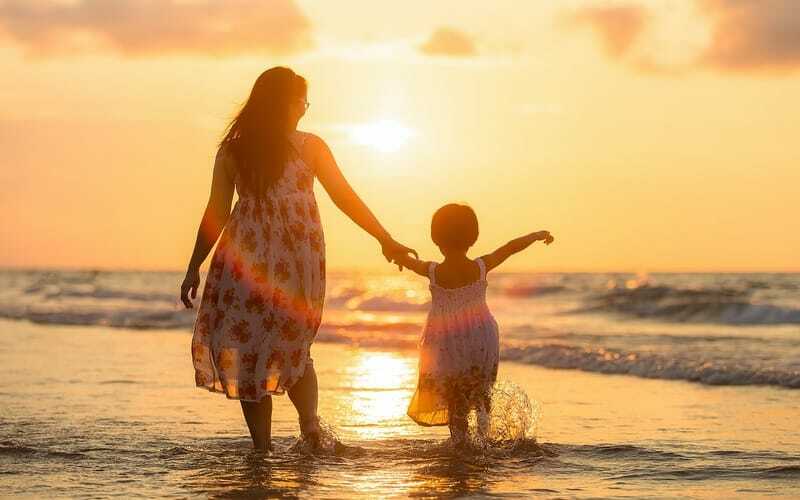 There is a very small beach here that will entertain your little ones, but the main attraction is the town itself and using it as a gateway to other towns around the lake. We took the ferry up the east shore of the lake to the famously picturesque town of Malcesine. Along the way you will get great views of the entire lake and to the mountains that rear up behind to pretty towns that dot the shore. Malcesine is charming with a beautiful setting and a maze of historic alleys leading up to the castle. It is very popular with day trippers so do not expect to have the place to yourself. To read our in depth guide to Lake Garda please click here. There are some great places to stay in Lake Garda, we always book through Booking.com they have great prices and free cancellations if your plans change. Hotel Al Castello – This is where we stayed. They do a great breakfast, are very family friendly and it is well located near everything (including the bus stop). We enjoyed our stay here. Residence Ca Del Lago – Lovely apartments with lake views. Has a nice swimming pool. Hotel Riel – A great option for families in Sirmione, Hotel Riel has clean modern rooms and a lovely swimming pool. Torri del Benaco to Verona: There is a direct bus to Verona (X05) but this only leaves at 06:35. At other times take bus 483 to Peschiera del Garda and then catch the train to Verona. 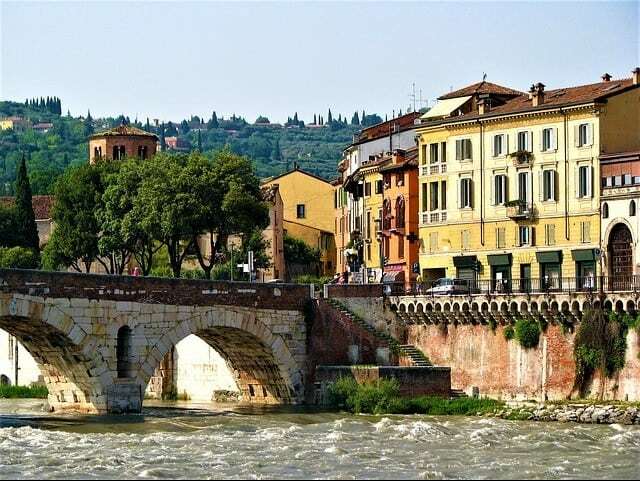 Nestled on a tight curve of the Adige River, Verona has been an important town since Roman times. Today smart shops and cafes fill the attractive and vibrant historic centre. It is a popular place with tourists but doesn’t quite enjoy the international renown of towns like Venice and Florence. It’s easy to spend time simply exploring the narrow streets lined with handsome palazzi that make up the historic centre. The town’s museums and churches contain fine works of art, while the views over the river from the ruined Roman theatre are well worth the climb up. Just inside the town walls is Piazza Brà, a large open space dominated by the Roman Arena, which now hosts open air opera in the summer months. We found some great restaurants in the small streets just off Piazza Brà, but the true heart of the town and its most majestic buildings can be found at Piazza Erbe. I’m not sure anyone has ever written about Verona without mentioning that it was the setting for Shakespeare’s Romeo and Juliet so I won’t be the one to buck that trend. It seems to be something that is being heavily pushed for the benefit of tourists but the links are tenuous at best. We had a quick look past the crowds at the famous ‘Juliet’s Balcony’ but chose not to post the dead, fictional character a letter at ‘Juliet’s Tomb’, this is an option if you feel inclined. We took a day trip to the often overlooked historic city of Mantua, again taking the train. It is a picturesque town surrounded by water with a skyline dominated by ancient towers, turrets and domes. The town is an architectural gem that has scarcely changed since medieval times (the defensive lakes that surround the city don’t allow room for expansion). It is a quiet but charming place to visit and is free from the crowds of tourists and tacky souvenirs stalls that you will find elsewhere. Verona to Ortisei: Take the train from Verona to Ponte Gardena then catch bus 350 to Ortisei. Remember to check the latest bus timetables. 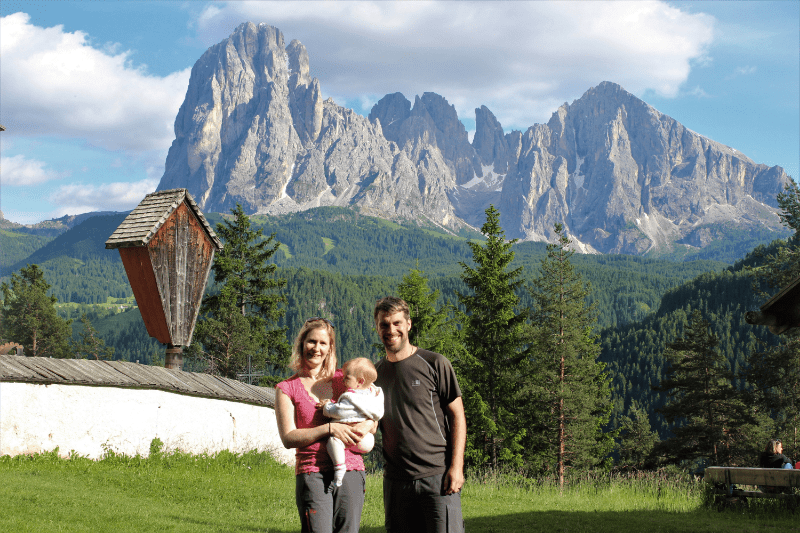 The rocky peaks of the Dolomites are iconic and spectacular so we were keen to include some time in the mountains despite them being slightly out of the way. 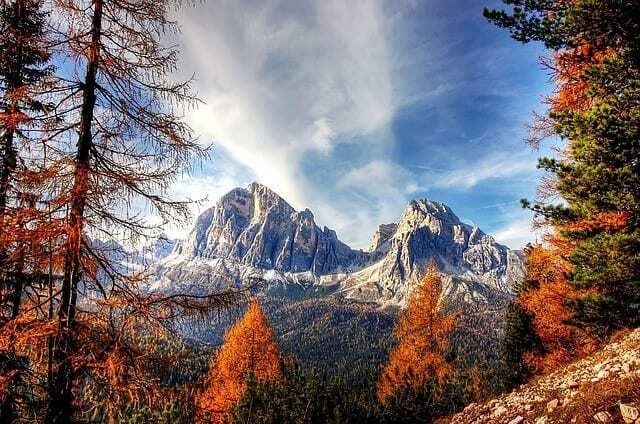 By staying in the Val Gardena area, we were able to enjoy stunning views and some great hiking territory that was very accessible by public transport. Not only was it easy to get to, but there is a good network of buses and cable cars that will help you get around once you have arrived. If your hotel in the valley is a member of the Tourist Association in Val Gardena, they will be able to provide you with a free bus pass, the Val Gardena Mobil Pass, for use on buses in the valley. The cable cars were great for allowing us to see a bit more of the mountains with our daughter. Carrying an 8 month old on a hike isn’t so bad (with a good baby carrier), but we don’t like to keep her cooped up in the harness for too long, so we were keen to find some hikes that were spectacular but not too epic. We stayed in pretty little Ortisei, one of four main villages in the 25 km Val Gardena. All are surrounded by impressive and powerful mountains and would make a good base for a few days in the area. We did 3 hikes in the area, one straight from our hotel, and two where we took the cable car up befre hiking at higher altitude. Before we came I knew that I wanted to see the classic dolomite rocky peaks, but I wasn’t too sure where they actually were and if this was a good place to see them from. Well, I wasn’t disappointed coming here, our first short hike out from Ortisei gave us stupendous views like the one below. We moved on from Ortisei to Siusi which is just around the mountain in the next valley. It was nice there too but it is so close that we would spend the extra nights in Ortisei were we to do this trip again. Ortisei to Venice: Catch bus 170 to Bolzano then catch a train to Venice. We spent a couple of hours walking around the charming town of Bolzano before continuing on the train. It is a lovely riverside town with a great atmosphere and we recommend doing this to split up your journey. Stepping out of the station at Venice is a moment that will stay with me always. You walk out and it is right there, the Grand Canal that you will recognise from so many films and photos. Boats and gondolas busily travel back and forth whilst tourists grab their cameras to take the first of many photos of this floating city. It is hectic and amazing all at once. Venice needs no introduction. 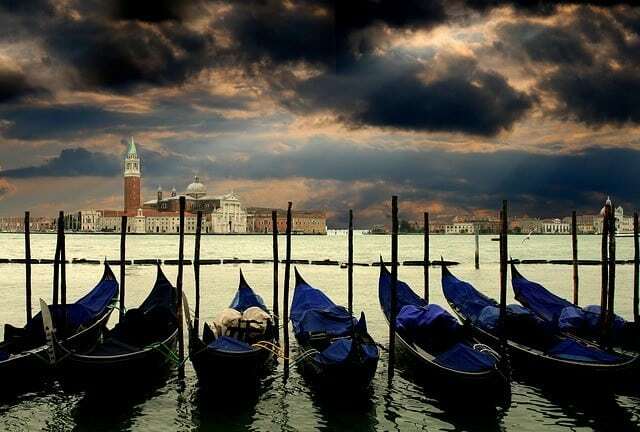 Even if you have never been, the name itself will instantly conjure up images of ornate bridges, cathedrals and palaces overlooking watery streets lined with gondolas. It is a place that has inspired awe in travellers for centuries and is surely one of the world’s great treasures. Having said that, I wasn’t too sure if we would like Venice. We had always liked to stay off the tourist trail and visit out of the way places, but Venice has a reputation for being crazily busy, and we were here in July at the peak of tourist season. I can safely say that we absolutely loved it. We are world travellers always on the lookout for new places and new experiences, and there is nowhere in the world like Venice. It truly deserves its fame and popularity. It is unique and stunningly beautiful. Yes, it is busy but other than one or two hotspots this doesn’t detract from the majesty of the town and it is somewhere that we think everyone should visit. No matter how many photographs or films you may have seen, it is still a jaw-dropping experience seeing Venice’s canals and palaces for the first time, and a trip down the Grand Canal is one of the great travel experiences. All of Venice is beautiful and if you wander the back streets and canals away from the main sights, it is easy enough to get away from the crowds. We spent very little time at the Rialto Bridge and St Mark’s square but the city is blessed with so many sights around every corner that you do not need to focus on these famous places. One of the best things to do in Venice is simply travel around using the Vaporetto’s. These are water buses that go back and forth along the canals, carrying tourists and locals to all parts of the city. Venice looks its best from the water so this is a great, low cost way to see the facades of wonderful, crumbling palaces that line the waterfront. You can buy a ticket that allows for unlimited journeys and you can even visit some other towns on the nearby islands, like Murano, Torcello and Mazzorbo. 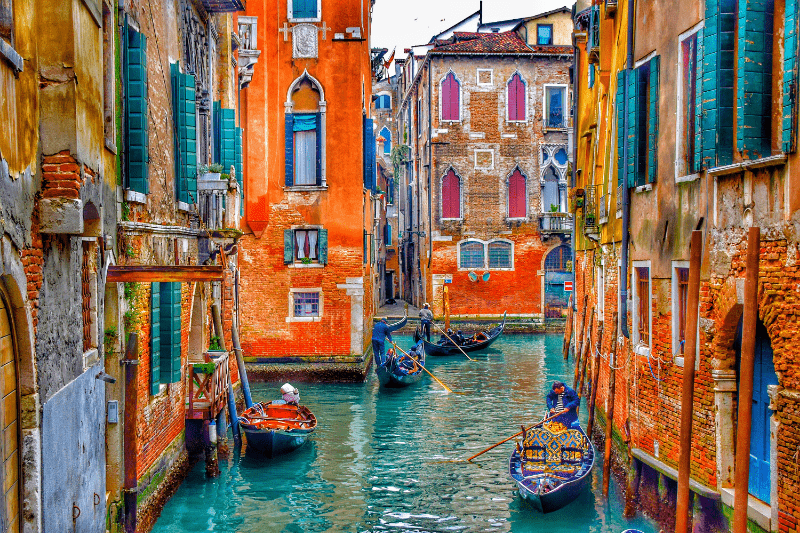 For loads of great ideas for things to do in Venice, check out our detail guide here. Hotel Palazzo Stern – Spectacular Location: For a truly memorable stay try this old palace right by the Grand Canal. The canal side terrace is an unbeatable place to have a meal or drink whilst the interior is opulent enough to make it feel like you are staying in a palace (which you are!). Ca’ Due Leoni – Where we stayed: This is a hidden gem located in a quiet residential area at the heart of the Cannaregio District. It is a small hotel that is great value with a pleasant courtyard for breakfast and antique furnishings for a touch of glamour. B&B San Firmino – Top rated on Booking.com: Overlooking the Santa Maria Formosa church’s baroque façade and the canal this B&B offers wonderful breakfasts and comfortable rooms. Venice to Venice Treviso airport: Catch the ATPO or Barzi shuttle bus. If you have time for an extra place, Treviso itself is well worth a visit and you can get there easily by train. Inspired to Visit Italy by Public Transport? We hope you have enjoyed reading about our trip through Northern Italy by public transport, it was a great trip to some lovely places with a good mix of sights. Traveling by bus and train proved to be very easy and it is worth considering this as an alternative to hiring a car. We hope that we have inspired you to head over to Italy, if you have any questions please ask below. This is a really good review. Italy has always been a place I’ve wanted to go for a long time, like many I’m sure. Even though I had pictured Italy numerous times, I failed to think of the mountain areas. This is somewhere I now have to visit as well as the cities. The pictures you added were beautiful to say the least. Thank you for sharing about transport as well, I know that can be tricky to a new comer like myself. Thank you for your kind words. I am actually back in Italy as I type this and I keep finding more and more lovely places to visit. Please do try and visit Italy, it is a wonderful country and the itinerary in this post would be a great introduction to the country for your first visit. Thank you! I am sure that you will love your trip! They are both lovely places to visit and it is great that it is so easy to get around this area of northern Italy. Hey there! Thanks for taking the time to write this detailed bus/train route for anyone travelling to Italy. I always love taking the bus because it is slower pace than driving myself and I can take in the scenery or get lots of pictures since I’m not focused on driving. It looks breathtakingly beautiful there! I agree, the train or bus are great ways to travel. You can calmly watch the changing scenery through the window without any of the hassle of driving or parking. Glad you enjoyed this post. What a wonderful country! Italy is one of the country i always want to visit when i get money. With your wonderful review i am eagerly to go there. Lovely views . It is a blessing to have such a lovely nature , great buildings. Thanks! Italy has it all, wonderful landscapes, amazing history, and great food on top. You cant go wrong choosing it for a holiday! 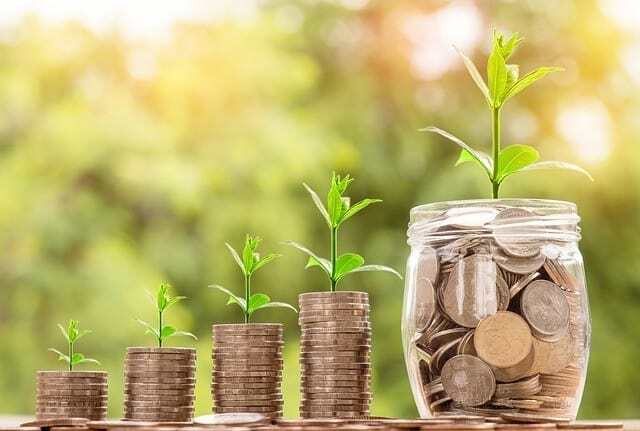 It is also cheaper there than you might imagine, you can get great pizza for only 4 euros, and you can find apartments for a whole family for around 45 euros per night. Thanks so much for this. We leave for Florence in two months and we try to research EVERYTHING that we can think of! It was extremely difficult to find good info about how the public transport works in Italy. At least in English! By the way, from the way you describe Venice, I feel like we’ll do a stop there as well. It looks beautiful! Thanks! I am glad that you found our post useful! You are right there isnt that much information out there about using public transport in Italy, we aim to fill that gap! Yes, you should try and make it to Venice one day, but dont worry, Florence is lovely too! You can get to Venice from Florence in 2-3 hours (depending on the train type), so you could combine the two quite easily. No problem, have a great trip!! Thank you for this wonderful article on Italy. I am planning a trip to Italy for next year and am using you as a resource. I have been to Florence before and loved it but I would really like to see the Dolomites. They seem incredible. I love the idea of traveling by train, as it would tremendously cut down on the cost of renting a car and it seems as if train travel is so easy in Europe. Thank you so much for the tips and information. By the way, what is your favorite, must-see place in Italy? That is a really good question, there are so many places in Italy that are must see places!! I have given some thought to the absolute must see if you can only go to Italy once and have only managed to narrow it down to 2 places: Rome and Venice. Both are amazing, when I went to Rome I was really impressed by how many ancient Roman ruins there are scattered about the city, and this is combined with the Italina piazza atmosphere that I love. As I have written above, Venice is just incredible, and probably just edges it as my absolute must see due to it being completely unique. They are about 3 and a half hour apart by train so can be combined quite easily. My other favourite places include Sicily, Sardinia, the Amalfi Coast and Matera. Good luck planning you trip next year, I am sure you will have a great time. Feel free to message me if you have any questions. What a good idea this is, seeing a country via public transport allows you to see the real side of that country and oral has some terrific scenery . 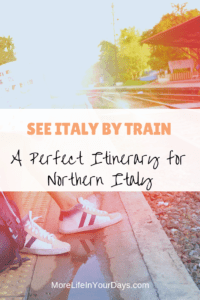 Your post has just simplified how to plan a journey through Italy using their rail network. Italiarail makes it easier by having an English to me it easier to plan your trip. The train network seems highly useful and efficient with phone storage for your train ticket. I’ve bookmsrked your review to go back To as this really appeals to me. Thank you for your comment. Yes, the ItaliaRail site is probably the easiest one to go for, especially if you are not familiar with the Italian place names, many of which are quite different to the english versions. Enjoy your trip to Italy and please feel free to message us if you need any more advice. I’ve always wanted to go to Italy, it’s a dream of mine since I was a little girl. How amazing it is to be able to visit Italy by public transportation. This was an amazing read and very inspirational. Maybe one day when I can visit Italy, I will considering traveling it by public transportation. The experience would be very different. I am glad you enjoyed this post. I think that public transport is a great way to see a country and in Italy it is very easy to get to some of the best places just by using public transport.I have also done a nice route of Rome, Florence and Pisa by train that I may cover in a future post. A great decision! I hope you have an amazing trip – I know you will, you can’t go wrong visiting Italy!